This volume features 15 articles on a variety of glass topics. 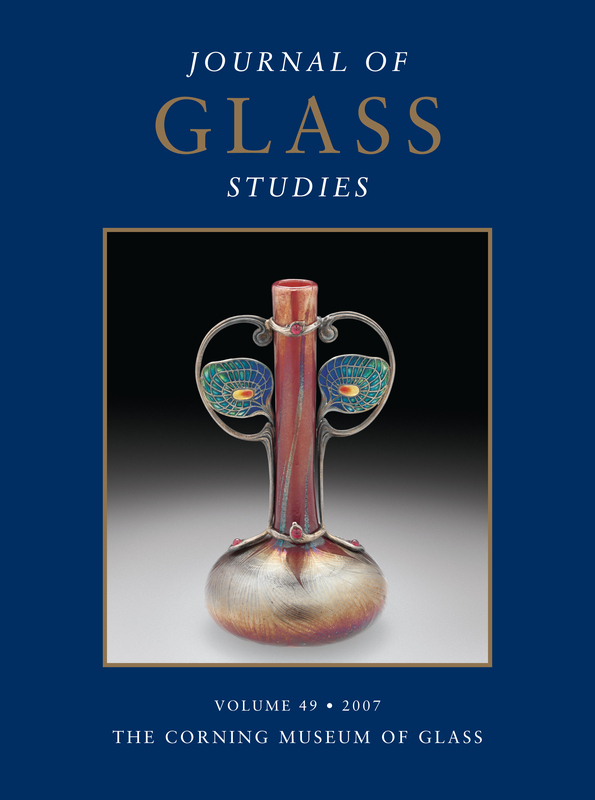 Included are Jane Shadel Spillman's look at Frederick Carder's 1902 trip to glasshouses across Germany, Bohemia, and Austria; Susan H. Myers's report on the Smithsonian Institution and American glass manufacturers from 1886 to 1896; and David C. Watts and Hugh Tait's look into the authenticity of a 1762 glass catalog. In addition, important recent acquisitions are listed, with pictures. This article presents a fragment of polychrome cameo glass that is in the collection of the Akademicksches Kunstmuseum in Bonn. This piece, which is published here for the first time, is one of the rare examples of cameo glass with multiple layers. It consists of five layers of blue, white (two layers), green, and red glass. Stylistic analysis of the sphinx, the only recognizable surviving part of the decoration, suggests that the fragment can be dated to the early Ptolemaic period. The piece seems to be an early precursor of Roman cameo glass. In any event, it raises questions about the study of the production of cameo glass. This article provides a list of finds of molds or mold parts, followed by a selection of finds that suggest the use of molds for glassblowing. Interpretation of the statistics shows that most of these were stone molds, followed by ceramic molds. These molds were employed for simpler vessels, and ceramic material was also used for more elaborate forms and decorations. Bronze was utilized during and after the late Roman period. The use of plaster and wood seems unlikely, although wood was employed for the fashioning of tools. All of the stages involved in the making of molds, in any of these materials, were demanding and time-consuming processes, and they were probably undertaken by specialized craftsmen. Although they offered the advantage of speedier production, elaborate mold-blown vessels were more costly to produce than simple blown objects. For a long time, Turkey was terra incognita in glass studies. Little by little, glass typologies have been published, although a comprehensive treatment of glass as a separate category of small finds is still awaited. A large gap in our knowledge continues to exist, particularly regarding the technology of glass production. No in-depth analysis of workshop-related finds has yet been published. With this article, the authors offer an overview and evaluation of various types of finds related to glass production. These finds were made in present-day Turkey, and they date from the beginnings of glassworking in antiquity to the Middle Byzantine period. New finds from the Pisidian town of Sagalassos are also presented. This article examines statistically and classifies typologically glass finds from a sixth-century Christian basilica, now known as the Museum Basilica, in the city of Philippi. (The basilica was destroyed in the early seventh century.) The finds include fragments of multicolored windowpanes and lead strips that were used to assemble them, offering the earliest examples of this technique. Among the glass vessels, five types of lamps, two types of flasks, and two types of smaller toilet bottles were discovered, all of which may have been locally produced. In any case, they are very close stylistically to eastern Mediterranean wares. A few chunks of glass show that glass was worked in the area, while mosaic glass cakes attest to the on-site production of tesserae for the wall mosaics of the basilica. Although the Byzantine glass bowl with painted decoration in the Treasury of San Marco, Venice, has been described and discussed on numerous occasions, examination of the object in 2006 revealed a number of features that hitherto seem to have escaped attention. The pseudo-Kufic inscription on the outside of the wall is not silver stain but at least partly enamel (the inscription on the inside of the rim, however, is undoubtedly silver stain). All of the decoration—gilding, enamel, and silver stain—was completed by attaching the bowl to a pontil and firing it in the mouth of the furnace. The interior of the vessel has gilded and enamel decoration. Abrasions on the rim, wall, and base suggest that the vessel may have had an attachment before it received the extant mount. In 2004, a cast glass plaque with the portrait of King Louis XIV of France came on the market. It is one of eight known plaques with the king’s portrait, but it is markedly different from the others in that it was painted by an artist of apparently Asian origin, who misunderstood some of the relief features. Because of its Asian characteristics, this plaque is thought to have been a gift of the Orléans glassmaker Bernard Perrot to ambassadors of Siam in 1686. This article explores the diplomatic relations between France and Siam in the 1680s and points to the considerable interest of the Siamese in French glass. A list of purchases that King Phra Narai of Siam wished to make in France includes tens of thousands of glass items. It is a valuable source on the early history of mirrors, chandeliers, and even furniture made of glass. The article concludes with a catalog of the eight plaques. This article discusses the dissemination of knowledge on glass throughout central Europe and beyond during the early Baroque period. It relied primarily on a network of oral communication, beginning with the scientist Johann Rudolph Glauber (1604–1670). Glass was not Glauber’s principal concern, but it proved indispensable to his work in chemistry on an almost industrial scale, which, from 1640, he pursued mainly in Amsterdam. He discovered a process to analyze ore in a melt of powdered glass, and he was the first to describe Purple of Cassius. His knowledge became the foundation of glass technology of the time, as practiced by his disciple, Johann Daniel Crafft (1624–1697), and by others. They included Johann Kunckel (about 1637–1703) in Brandenburg; Colonel Bon in southern Bohemia in 1673–1674; the Carthusian monk Giacomo Bernardini Scapitta in the 1670s and 1680s; the Jesuits Christoph Diem (b. 1636) and Kilian Stumpf (1655–1720), who brought knowledge on glassmaking to China; and the economic theorist Johann Joachim Becher (1635–1682), whose role as an innovator in glass technology has been exaggerated. About 360 Zwischengoldglas objects from the collection of the Museum of Decorative Arts in Prague were examined in order to check their condition, to explore the technology of their production, and to provide the museum with recommendations for conservation. This article examines the history of Zwischengoldgläser, along with their glassmaking technology and their shapes and techniques of decoration, concentrating on production in Bohemia from about 1710 to 1760. The most common forms include beakers with faceted sleeves decorated with faux marble painting or colorful painting on silver leaf combined with gilding, and monochrome beakers with decoration scratched in gold leaf. This article presents enameled lattimo glasses from Daniele Miotti’s workshop and one piece from an unknown Muranese glasshouse. Two glass plaques, signed “Al Gesù – Murano,” illustrate Old Testament subjects. These works are based on two early 18th-century engravings imitating themes depicted by Raphael in the Logge Vaticane. Another engraving from a Raphael painting, S. Cecilia, was used for a Miotti cup. These works are decorated with flowers that were also shown in porcelain, embroideries, textiles, jewelry, and decorated papers. Another Miotti piece, with flowers and a parrot, derives from an engraving by Justus Sadeler of Venice (d. 1620). Another Raphael-influenced engraving was used for a lattimo vase. It imitates the lost work Venere, Mercurio e Amore al Bagno. Landscape themes were chosen from sources in Bassano, where Remondini, one of the most important northern Italian art publishers of the time, was active. There can be little doubt that the murrhine ware that served as a paradigm of luxury and extravagance in antiquity consisted of fluorite (or calcium fluoride, CaF2), although other materials, including glass, have been suggested. Uncertainty lay largely in the fact that few examples of ancient murrhine ware survive, since the material was very fragile on account of its crystalline structure. This article examines a catalog, now in the collection of the Rakow Research Library of The Corning Museum of Glass, and challenges both its attribution to the Namur glassmaker Sebastien Zoude and its dating to 1762. The authors observe that both versions of this catalog lack features necessary for identification, that they have no indication of a date, and that they employ the same unrelated distressed handbills for their title page. One version, drawn in red chalk on small pieces of paper, indicates that these drawings came from pocket notebooks. The drawings fall into three groups, which were probably produced after the manufacture of crystal glass had ceased at Zoude’s factory following his death in 1778. The second version of the catalog, drawn in ink, was not intended as a fake, but perhaps as a Zoude family heirloom. The items depicted were not necessarily made by Zoude. The Belgian glass collector Armand Baar is tentatively suggested as the source of the Zoude catalog, which was initially acquired by Raymond Chambon. This article reports that, based on publications of 1727 and 1783–1787, five colored glass beakers—blue, green, red, amethyst, and agate—in the museum at Waldenburg (Saxony) appear to be the first glass vessels made by Johann Kunckel (d. 1703) as a result of his scientific research and experiments. He was active in Berlin and Potsdam, and he became a member of the Leopoldina (academy of sciences) in Halle in 1693. The vessels were part of the collection of members of the Linck family. They worked as pharmacists in Leipzig, where Kunckel had close scientific and economic connections with Heinrich Linck (1638–1717) and his son Johann Heinrich Linck the Elder (1674–1734). The author compares the beakers with glasses in Kassel and in Copenhagen (Rosenborg Castle), and she traces the relationships between the ruling families of Brandenburg, Hessen-Cassel, and Denmark. Antonio Salviati was a lawyer with no glassmaking experience when, in 1859, he and the Muranese technician Lorenzo Radi founded a Venetian workshop for the production of mosaics. The mayor of Murano, Antonio Colleoni, Abbot Vincenzo Zanetti, indefatigable promoters of the revival of Muranese glassmaking in the second half of the 19th century, regarded Salviati as talented, entrepreneurial, and well suited to establish a factory in which outstanding 15th- and 16th-century glass objects could be reproduced. In February 1866, Salviati traveled to London to study the market. During his stay, he sent several letters to his wife and to Colleoni. These letters provide detailed insights into how the objects to be reproduced were selected, and they include information about difficulties that were encountered in the early production. In a climate of rapid industrial development in the late 19th and early 20th centuries, the Smithsonian Institution established a Department of Arts and Industries in its United States National Museum, which opened in 1881. A centerpiece of collecting for the new department was the acquisition of contemporary manufactured goods, including American glass. Companies readily provided examples of their current glassware and sometimes also donated items such as tools or photographs in keeping with the museum’s interest in creating educational exhibitions for public display. These collections, and the correspondence that accompanies them, offer an important, tightly datable glimpse of American glass and of the museum’s concerns of the period. This article discusses the earliest phase of this collecting, between 1886 and 1896, in which the New England Glass Company donated examples of its new “Pomona” glass, three Pittsburgh area glassmakers provided colored, pressed, and cut glass, and the museum acquired 39 examples of Louis Comfort Tiffany’s new Favrile glass. Frederick Carder was a designer with Stevens & Williams, an English glass manufacturer, and he was later the manager of Steuben Glass Works in Corning, New York. He was very much interested in manufacturing techniques as well as design. This article presents a transcript of Carder’s journal of a trip to Germany, Austria, and Bohemia in 1902 to see glass manufacturers at work. Carder’s observations on the Continental glass industry and his comparisons of European and English practices provide an important firsthand account. He believed that the Germans were much more efficient and much more willing to adopt new machinery and new techniques than were the English glassmakers. As an appendix to the article, there is a briefer account of Carder’s 1903 trip to observe the American glass industry.